Previous: Digital encoding. Legacy software. Evolution. Next: Sure, we have imperative and functional. But what about cartesian programming? The shortcomings of TCP connection termination have been described many times. If you are not familiar with those problems here's an example of an article that focuses on the problem. However, there's one special use case that is rarely, if ever, discussed. Imagine a TCP client wanting to shut down its TCP connection to server cleanly. It wants to send the last request to the server, read any responses it may produce and exit. Given that it has no idea how many responses are about to arrive it can't just close the socket (it would miss the responses) but, at the same time, it cannot just go on reading responses forever (that would make it hang after the last response is received). What it needs is some way to let server know that it is shutting down. The server should then send back all the pending responses and subsequently acknowledge the shut down. This is what TCP half-close mechanism is for. Client sends a request and shuts down outbound part of the connection (see shutdown() function). Afterwards, it can't send more data but it can still receive data from the server. When server realizes the client has half-closed the connection, it will close the other half of the connection. Technically, this works by sending FIN packets, the TCP's equivalent of EOF. Client sends data, then sends FIN. Server receives the data, processes it, sends the responses, receives the FIN, then sends FIN back to the client. Client receives the responses, processes them, receives the FIN and at that point it knows that everything went OK and no data was lost. So, what can go possibly wrong? Well, imagine that server wants to do clean shut down as well. 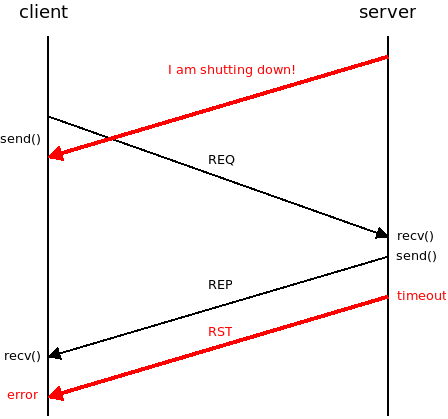 It doesn't have to do that as often as client does, but it may still happen that request for clean shut down from client coincides with request for clean shut down from server. That's where the things can go awry. Look at the server side: Server does half-close, then receives a request. It can process it, but it can't send the responses! 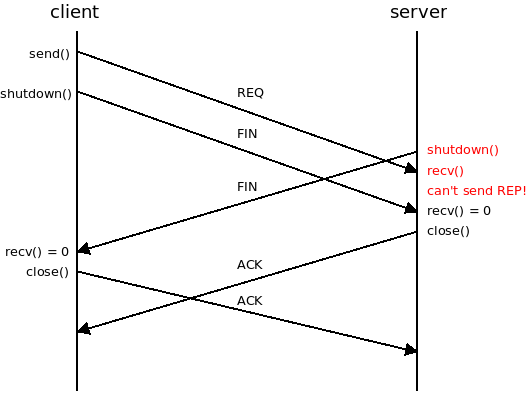 The outbound half of the TCP connection was already closed by shutdown() function. What it can do is to close the socket which will result in sending FIN to the client. But look at the client now: It's waiting for responses and considers incoming FIN to mean "no more responses". But, actually, there were responses! It was just the server was unable to send them. This scenario breaks the reliability guarantees of the half-close mechanism. OK, so maybe we can fix the problem by making the simultaneous shutdown an error rather than a success. It would require no change to TCP protocol, just to TCP API. When endpoint sends a FIN and then receives a FIN from the peer without first receiving an ACK for the former FIN, it would return an error to the user. Well, consider a protocol on top of TCP. It has its own terminal handshake and once that is done both peers close the underlying TCP connection. But that terminal handshake gets the peers in sync! They will attempt to do TCP shutdown simultaneously and will almost inevitably fail with the error we've introduced above. So that's not going to work. What about server sending RST instead of FIN then? Yes, that would work, but it's not a clean shut down. It means that server, when shutting down, forcefully breaks all the connections to the clients without giving them any grace interval to finish their stuff. That, finally, brings me to my main point: Terminal handshake, to be fully reliable, has to be asymmetric. If both peers are using the same algorithm they are going to run into race conditions such as those described in this article. And, by the way, this observation is not specific to TCP. It applies to any protocol with symmetric shutdown procedure. Note how sending the "I am shutting down!" message does nothing to the underlying TCP connection. The server is still able to both send and receive data. It can continue working as normal, thus giving the client a grace period to shut down. The client, on the other hand, is expected to finish whatever it is doing at the moment and do the classic connection half-close. This, of course, gives client a chance to misbehave a block server's shutdown by simply going on as normal and not doing the half-close. In that case though, it's perfectly reasonable for server to forcefully close the connection after the grace period expires. That's all from the technical standpoint. Now let me say few words about why I consider this topic important. First, there's this not widely known theoretical result: If you want your protocol to be fully reliable in the face of either peer shutting down, the terminal handshake has to be asymmetric. As we've seen above, TCP protocol has symmetric termination algorithm and thus can't, by itself, guarantee full reliability. Second, I am currently working on BSD socket API revamp and it's not clear how to address this issue. On one hand, the problem is so obscure that we can't really count on the protocol user to get everything right. So, the API could force the protocol developer to implement the termination mechanism correctly. That way the user wouldn't have to care. On the other hand the API should support the existing, not fully reliable, protocols, most importantly, TCP. 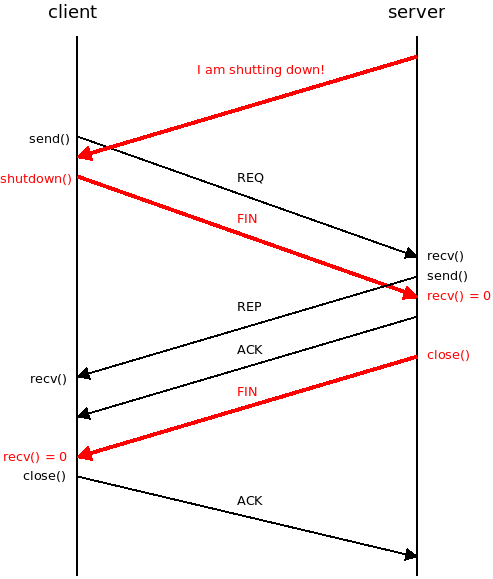 But that raises an API design problem: Given that there are so many ways to terminate a connection (forceful termination, single-step TCP-like close, two-step TCP-like termination with half-closes, full-blown three step termination as secribed above) how many shutdown APIs should there be? If there's close1(), close2(), close3() and close4(), it's going to get super confusing pretty quickly. If there's a single API, it can't give the same reliability guarantees for every protocol. 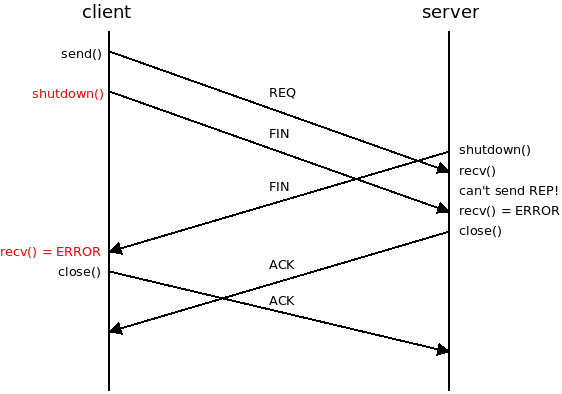 In the second diagram, I would argue that the server code is wrong: if it can't send responses anymore, it should not process packets either. The only reason the server should still receive packets is to get answers to requests it sent to the client before shutdown(). 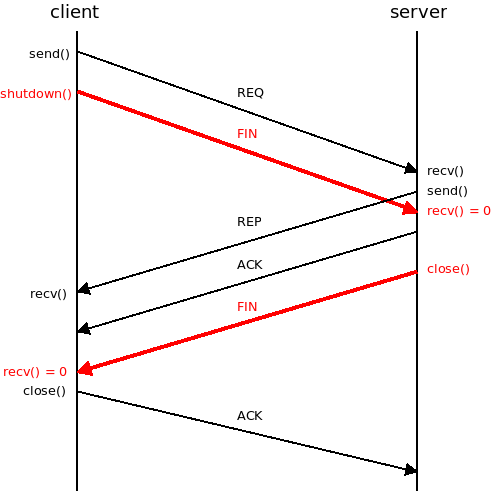 It stands to reason that the protocol layered over TCP should be designed in such a way that if you shutdown on the server but still read packets, you should ignore new requests from the client, and answers to your requests should not require answers themselves (or those can be omitted without further complications). If you think that servers must be able to process requests after shutting down, then that should probably be substantiated better. So what do you propose? Sure, server can drop packets after it called shutdown(). However, if it does so and sends FIN to the client, client will believe the packets were processed and will complain that "TCP is not reliable". It seems obvious you need some form of application level acknowledgement: receiving data is no guarantee it will be processed, for a multitude of reasons (which may have nothing to do with networking). Because one can pull the plug on a server, does it means TCP is unreliable? If your message queue is dead and all packets go round and round in a circular buffer? The protocol is well-named: it ensures reliable transmission. If you get an ack, well the server has the bits on it somehow, whatever happens they haven't been lost in transit. At this point the important thing to ensure is that either the packets hit the application OR the connection is shutdown (orderly or abruptly). In other words, what we really want is (1) avoid is somehow losing SOME of the packets between the NIC and the application, (2) if packets never hit the application, the connection should probably die at some point (although even this can be argued). People that don't understand this shouldn't be allowed to touch TCP, and much less listened to. This probably sounded way too much like a lecture — force of habit — but I realize you're probably not the one I need to convince. The thing is, I believe just adding app-layer acks is as clean and conceptually simple as it gets. Do you really think muddling with the boundaries will help, or is it just addressing complaints? "But look at the client now: It's waiting for responses and considers incoming FIN to mean "no more responses". But, actually, there were responses! It was just the server was unable to send them." How can the client assume that there were "no more responses" when it hasn't gotten an ACK back? Because FIN means that server has closed the server->client half of the connections. No more bytes are going to arrive. Since the client has not received an ACK for its packet, shouldn't it wait for it anyway? After all, the FIN and ACK could always have been reordered in transit, so the ACK could still be coming. Would using two descriptors for a binary stream (TCP) work, as mentioned in https://cr.yp.to/tcpip/twofd.html ?